I finally got my Ancestry DNA results! Scroll down to jump into a video where I talk about it. I began this journey a long time ago but I only just started documenting my process. The first part of this series is here for your reading pleasure. Ok…so first, my sincerest thanks are in order. Activists for Ancestry gifted me this kit. The organization raises funds to purchase DNA kits for activists engaged in social justice work. I am humbled by the prize and excited to share my results. Which is a breakdown of your DNA by region. I expected there to be more Spain/Portugal but surprisingly, Italy/Greece is most prominent. I also anticipated much more West African and much less native American DNA. So while there was nothing very shocking about my results, there are a few surprises! My mix is interesting and I’m still trying to figure out what it means and how I can use this to connect some dots. While this has certainly given me some answers, it leaves me with many questions too. Ireland? Where does that even come from? I don’t know my biological father and I never cared or needed him. I have always had a beautiful foundation and safe place to land in my parents. My journey toward self discovery was never a journey to finding or knowing him or “that side” of myself. What I am looking for he could never provide anyway. I am looking for wholeness. I am searching for the stolen pieces. Language, traditions, undiscovered spirituality and an ancestral home. Where did I come from? What am I made of? 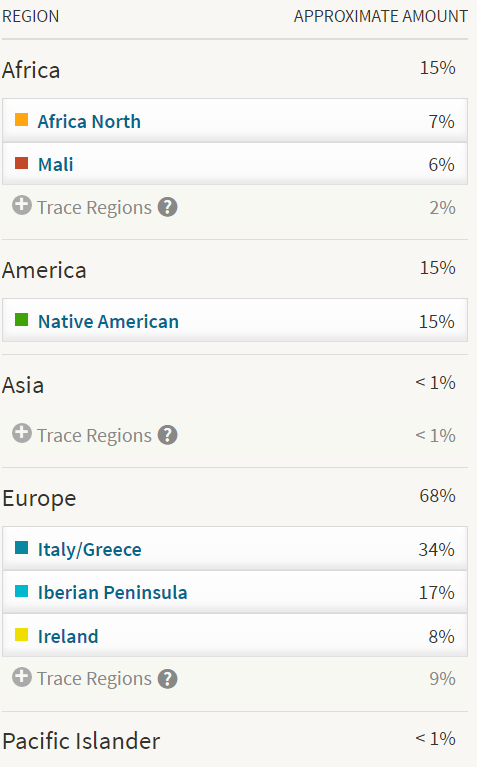 With a little spit and some solid science, I have actual answers…my bits of DNA tell me my personal history. This has given me something I’ve searched for always, a place to start with plenty of breadcrumbs to follow. Ok! My video…My thoughts were rushed and scattered and I’m overly excited. I don’t apologize but, if you have any questions ask away in the comments!